This is a horrible mess of barely-idiomatic functional code. It’s difficult to read and nearly impossible to maintain; but it’s purely immutable! This is not how you want your code to look. In fact, this is an excellent example of what David MacIver would call “bad functional code“. One solution to this problem which provides a compromise between these two worlds is that of a partitioned trie (pronounced “try” by all that is sane and holy). In essence, a partitioned trie is a tree of vectors with a very high branching factor (the number of children per node). Each vector is itself a tree of vectors and so on. Note that these are not not like the binary search trees that every had to create back in college, partitioned tries can potentially have dozens of branches per node. As it turns out, it is this unusual property which makes these structures so efficient. The implementation of Vector which I present in this article is inherently much less efficient than the one Rich Hickey created for Clojure. I finally broke down and created a line-for-line port from Clojure’s Java implementation of PersistentVector into a Scala class. I strongly suggest that you use this (much faster) implementation, rather than my own flawed efforts. You can download the improved Vector here: Vector.scala. This is, incidentally, more or less how the new IntMap in 2.7.2 works. The details are different, but the idea is the same. IntMap is persistent, but it’s not a partitioned trie in the same sense. I had a cursory glance at the source code, and while I’m certainly not grokking everything involved, it doesn’t look like quite the same idea to me. IntMap seems to be a more dynamic tree structure for the branches, whereas a partitioned trie uses an array (for constant lookup time). Actually, IntMap looks like it might be *more* efficient for some operations (like any modification), but I’d have to really sit down and figure it out to be sure. Finally, IntMap is just that, a Map. It doesn’t implement Seq directly or indirectly (much less RandomAccessSeq), so it is unavailable for a lot of operations. The Vector implementation I gave is an immutable drop-in replacement for Array. That’s not to say that a wrapper could not be implemented *around* IntMap to provide such an interface, but it presently does not satisfy that constraint. I suppose this does bear out my analysis of the distinctions between the average lookup times. However, given the fact that the bit-partitioned trie has a lower average depth, one would imagine that this hindrance would be nullified. Considering that the BitVector has a major optimization which is lacking in the Vector implementation (tail and head arrays), I think this is pretty impressive. It’s also interesting that the bit-partitioned implementation has far more wild fluctuations in its results. I would imagine that this stems from the random nature of the tests and its more complex “worst-case” (since indexes could technically “stack up” linearly like hash buckets). Right. I wasn’t saying “Why would you use this when there’s IntMap?!”. They have a fundamentally different interface if nothing else. Just that the basic idea of a Trie on integer keys is similar. As far as I can tell the two major differences are that IntMap will shortcut boring segments of the keys (so if you have two keys which differ in only a few places it won’t branch for the places where they don’t differ) and that your implementation builds much broader trees (which is great for reads and bad for writes). Which is why I said that it’s fundamentally the same idea, just differing in details. In particular it’s probably worth considering making your version shortcut similarly to IntMap and my version broaden similarly to Vector. As a side note, I’ve been sketching the details for implementing a similar structure which is somewhere between this and a finger tree. It would have the characteristics of the Vector but would also have fast add and remove to both ends and fast concatenation (also access to indices near either end point would get a non-trivial speedup). There’s an easier (and faster) way to compute the path. The trick is to start with the last digit instead of the first. To get the last digit of a number you compute `n % base`. e.g. 1234 % 10 = 4. To remove the last digit you (integer) divide it by base: 1234 / 10 = 123 (x86 processors do both steps in one divmod instruction, but if you choose a power of 2 base you can use two shifts, which is even faster). Otherwise you’re assuming that we’re storing collections in the vector? Couldn’t you set branches to null in the default constructor? There would be some more checks but you would save a bunch of space on arrays that you can never put anything into. I think it’s a better idea to set branches to the array of the size we actually need. Then if you have, say, 33 elements in the vector, you need just 1 array of size 2 (at the root), 1 array of size 32 (left branch), 1 array of size 1 (right branch) and 1 array of size 0 (since it can be shared between all leaf vectors). I’ll have to look more closely at IntMap, the branch shortcuting sounds quite interesting. The only problem I see with it is it sounds like the structural location of a given index is partially dependent on the structure of the rest of the trie. Just talking off the top of my head, but wouldn’t that require that you store the key along with the value in each node? Bit-partitioned tries require this too, and one of the things I noticed in my benchmarking is that it has a deleterious impact on read-times (since reads can sometimes become linear on a set of possible targets). Shortcutting doesn’t sound quite as bad as the bit-masking technique of “just taking what you need” from the key, but it sounds like the impact to the structure is in the same conceptual vein. Am I wrong? The path computation algorithm that you described would be a little-endian path rather than the big-endian that I use. Technically speaking, they have the same worst-case performance, but I’m pretty sure that the average write performance is slightly better with big-endian. My reasoning for this is the fact that big-endian will result in repeated writes to the same super-branch when incrementing the index (a common pattern). In turn, this means that a large number of branches retain empty child arrays for a longer period of time, while one child array is copied repeatedly as the key traverses its range. In truth, I’m not sure whether or not this yields better performance. However, if I followed @Asd’s excellent suggestion of avoiding the creation of extra arrays, I would save a tremendous amount of space using big-endian rather than little (since nodes would remain without children for longer since the children would be grouped rather than distributed). Bit-partitioned vectors have little-endian ish paths, though not precisely since a higher index can come structurally above a lower index with the same trailing bits. In terms of raw performance (ignoring memory), it’s hard to say which is better in the average case. For a random set of indexes, they are identical. That would lead to truly constant read times, but extremely poor writes. Literally, this would be the same as maintaining an array and copying it every time new data was to be inserted. Partitioned tries are a compromise between this full-copy strategy and the need for fast reads. The branching factor is a direct reflection of this compromise. One of the nice things about a path-partitioned trie rather than bit-partitioned is that the branching factor may be set on instantiation. This would allow the developer to “tune the vector” as it were, reflecting the case-specific needs for better reads or better writes. I don’t see how it would “be the same as maintaining an array”. I am talking about the following scheme. v = new Vector[int] //v == Empty. Oh, I think I see what you’re saying! So you still have a static branching factor, but the individual branch array for each sub-vector is only sized just large enough to contain is maximum index? That’s terribly clever. It does require that the branching factor be maintained as a separate value within the class, rather than relying on the array length. This is a good idea anyway, considering the fact that having sub-vectors with different branching factors would lead to inconsistent results (and crashing). Anyway, this is almost a more general space-saving solution that the idea given previously of lazily creating branch arrays. Also, it significantly reduces the average insert complexity due to the fact that rarely would an entire array of length=branchingFactor have to be copied linearly. I was planning on continuing to tweak my path-partitioned implementation a bit more; I’ll try applying this technique and we’ll see how much it saves! There are also finger trees, ropes, and some more useful functional data structures. I tend to think that there was probably some weird process running on my machine while running these tests, given the dramatic spread we’re seeing. So if I had to pick a number to “believe”, it would probably be in the range of 100ms. If that is indeed the case, then the optimizations have yielded an 80% reduction in test suite runtime. The bigger gain (I imagine) is the memory utilization, which I did not measure, but is likely orders of magnitude lower than the original implementation. In fact, as far as random access sequences go, this implementation is probably even more efficient than a mutable array in terms of memory, especially for wide index spreads. How’s performance compared to ArrayList? @Daniel: I’m not sure if I understand what you mean by big and little endian. You mean compute_path(1234,10) => [1,2,3,4] is big endian and [4,3,2,1] is little endian? My example is big endian: compute_path(1234,10) = [1,2,3,4]. It does start with the last digit, but because cons() adds an item at the front of the list the result is cons(1,cons(2,cons(3,cons(4,nil)))). Daniel, this is some great stuff. I’d love to see it in the standard library, but in the meantime, why don’t you contribute it to scalax? I haven’t benchmarked against ArrayList (yet), but read time should be comparable (as in: very, very close). Writes are probably a bit more widely separated, though with a wide index spread you may see closer performance between the two (maybe even superior with the immutable implementation). Where Vector really shines is in the memory utilization with extremely high indexes. Potentially, Vector could be many orders of magnitude smaller in-memory than ArrayList, due to the fact that it does not require large contiguous blocks. Well, if I read the code, that would be helpful. Sorry, my brain was a bit mushy yesterday, I somehow missed the key points of your algorithm. You are quite correct that using mod and starting from the right is more efficient. I had tried to do it that way originally, but somehow I wasn’t able to make it work. Now a feel a little sheepish about it. I would also love to see it make it into the stdlib. I’m guessing this just requires community interest and a ticket in Trac? (as well as a well-tested implementation of course) In the meantime though, I’ll shoot an email to Jamie Webb and attach the current incarnation of the implementation (Mercurial probably won’t work well on my current system). I’m still working on efficiently implementing some of the common collection operations, and once I have that done I’ll get up the nerve to pitch it to LAMP. error: ‘this’ expected but ‘val’ found. t3a.scala:5: error: ‘(‘ expected but ‘;’ found. in the arguments to this(). You’re quite correct of course. I’ll fix the snippet. I suppose that one way of getting around this would be to move the calculation into a method in the companion object, but that’s a little ugly. Scala really should allow vals to be used prior to this(…) in secondary constructors. There’s no problem with this in compilation since vals can be inlined, it’s just a clarity thing. hey daniel, a very interesting class. in fact i’m always struggeling with the problem of concurrent updates of structures. i basically use a mix of immutable (for simple objects) and mutable (for more complex objects – due to the lack of algorithms like your one) approaches. i have tested your Vector class and wonder if it could be combined with the concept of interval keys, in order to obtain a kind of internal tree (–> http://www.nabble.com/scala.Collection,-Seq,-jcl.Collection,-Buffer-td18033249.html )… what i need is a robust fast data structure that can handle lookup, insertion and deletion of items in O(log(n)) time, where lookup means finding items by a key (so it’s a kind of Map) which is a time interval (given in integer sample frames). thanks for hints and suggestions! Hmm, I’m not sure I understand completely what you’re trying to do, but I can definately help you with a log(n) efficient Map! What you want is a functional, balanced binary search tree. Traditionally, most languages use an immutable Red-Black tree for this case, but Scala actually has an even faster implementation: scala.collection.immutable.Tree. This structure guarantees O(log(n)) for all operations. It’s actually possible to do a little better though. Clojure has a persistent hash map based on Bagwell’s ideal hash tries which is able to claim O(log32(n)) for all operations. This is actually even a little better than conventional mutable bucket hashing which has an absolute worse-case O(log(n)) (when everything hashes to the same bucket). I haven’t had the chance to port Clojure’s hash map to Scala yet, but I’m working on it! This persistent hash map is very similar in design to the persistent vector (they’re both based on the same structural concept). TreeMap uses Tree to implement an essentially Red-Black tree structure. thanks for the fast reply, and thanks for the hint to TreeMap. in fact, i only understand the conception of scala.collection.immutable after reading your article – coming from the java world, i had always thought that that package is just creating read-only objects like java.util.Collections.unmodifiable(List|Map|…) ! i just realize the second issue is also true for the Vector class ;-( and i guess it’s a lot of work to modify it so that it accepts duplicate keys. (there is a trick however i read in a paper – you can store a proxy value for a key that points to more than one value, the proxy value contains a list of all objects stored under that key). however that introduces a new problem for the generics. i guess i will need to have a wrapper class to handle that. “give me all objects that intersect with Span( 10000, 40000 )” ? if i’m not wrong this requires a two-dimensional tree… or do you see another solution? thanks again! here is some measurements with the above code. t2-t1 is the loop adding elements, t5-t3 is the from and until operations, t8-t6 is creating the intersection between the from and until collections. interestingly, all are O(N), where i had guessed that t5-t3 should be O(logN) ? or do i have to use a special kind of iterator generation to get that performance? Ah, I didn’t realize that you needed range matching (I suppose I should have read your original post…). 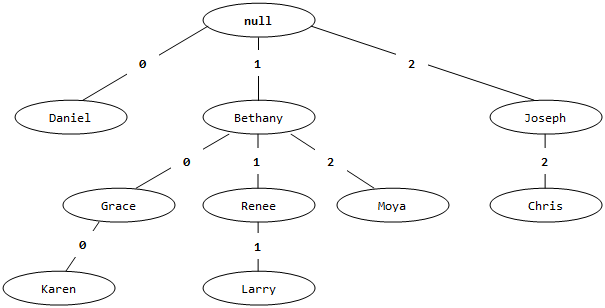 This is starting to get a bit out of my depth, but it would seem to me that you could match key spans in O(log(n)) time using a balanced binary search tree. This is because you can just treat ranges as trimmed sub-trees. Doing it immutably might be a bit tough, but still possible. It would seem to me that you could take advantage of Scala’s SortedMap#rangeImpl method for this, but I’m not entirely sure. A higher branching factor (such as is used in Vector) might be interesting to explore, but I don’t think it would help too much. In fact, I think it would hinder performance. For one thing, you would *have* to use a tree structure rather than a trie (otherwise range matches are still linear time). Also, bumping up the branching factor makes it much more complicated to just select out your sub-tree. You would have to trim nodes as well as trees, and that gets to be quite inefficient. … hopefully with some insight. Recommended reading: Chris Okasaki’s doctoral thesis was on persistent data structures and ways of making them efficient. It’s very readable and was actually republished as a proper book. ‹ How Do You Apply Polyglotism?